Oceans today are home to a variety of seals, ranging from leopard seals darting through Antarctic surfs in pursuit of a penguin to endangered Hawaiian monk seals lounging on sunlit shores. But how did seals first take the evolutionary dive into the oceans more than 30 million years ago? Paleontologists know that seals’ ancient ancestors lived and walked on land. But what helped transform them into marine mammals is a tale riddled with holes. Recently, a pair of researchers studying prehistoric seal fossils and remains of modern species, discovered a new piece of the story. They reported last month in the Journal of Vertebrate Paleontology that contemporary seals attack and bite their prey using much the same technique that their ancestors did millions of years ago. Their finding suggests that the ability to bite was an evolutionary adaptation that contributed to the animals’ ability to make a successful transition from land to water, said Sarah Kienle, a former San Diego State University graduate student and comparative biologist at the University of California, Santa Cruz who led the research. Seals today have a variety of eating styles. Take the leopard seal. If it catches its penguin, Ms. Kienle says, it will devour the bird in a characteristic way: it will bite it, and then shake it until the penguin breaks into pieces that the seal can swallow. But some seals also use additional eating techniques. Some sucking food such as fish from the water. Some take a gulp of krill and then filter out the water through their teeth, like baleen whales. Each species of seal has a unique skull and lower jaw shape that can be used to identify its eating style. 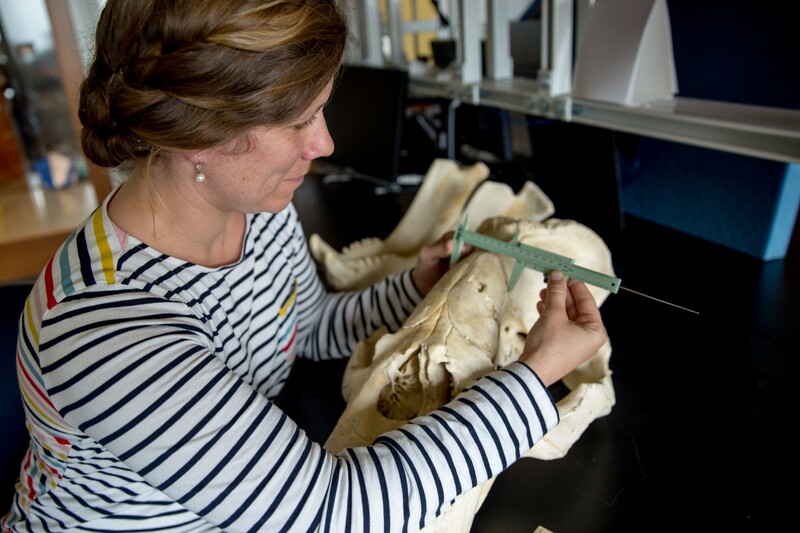 Knowing that these different styles exist, Ms. Kienle and her colleague, Annalisa Berta of SDSU, compared the bones of fossil seals with specimens of every known modern seal so that they could identify the eating styles of the seals’ ancestors. The team built digital maps using images of bones from 234 modern seals and 15 extinct seals. These maps clustered together landmarks on the sets of bones that the researchers say identified seals that fed by biting, using suction or filter-feeding. They then compared the maps from modern seals with those of extinct seals, and found that extinct species were mostly biters, suggesting that the ability to bite is something that seals inherited from their terrestrial forebears. And that likely means that the ancient seals who first took to the oceans started out with biting instead of the diverse eating styles of contemporary seals. “It makes sense, because they evolved from terrestrial carnivores,” Ms. Kienle said. She adds that seal ancestors were “able to take a feeding strategy that they were doing on land and successfully translate that to the water environment,” a technique that has allowed these marine mammals to thrive and diversify into a variety of ocean habitats some 30 million years later.